Southern Graciousness | It's In The Sauce! Everyone is more than busy, with little time to spare. But some people, not just Southerners, look past their own priorities to reach out and help others. “Southern graciousness,” which does not just reside in the South, can replace some of the negativity we are experiencing in our society, and bond us in a way that can transcend our differences. It certainly has for me. I had an accident recently, and have been overwhelmed with the care and concern of some of my friends and connections. Our family friend MoMo, who is an expert Nurse Practitioner, has moved in with us to care for me, changing dressings, cooking, and doing whatever is needed. She still manages all her responsibilities, including more than a full-time job. She has always been there when our family needed her. She is more family than friend. Our neighbor, Laurie, was right over when she heard of my accident with a sweet note and a plant, even though we haven’t seen each other for months. A better neighbor cannot be found. Our youngest daughter, Chatham and her husband Johnathan who live near us came over and brought a meal the first night after my accident. And the love and caring of my husband, Mike, has been ever present throughout. My Solo Sisters (Solo Sisters are women without siblings) brought a delicious meal, delivered by our most gracious founder, Sally. There were also texts and calls of support. Many in both of my book clubs have reached out with support and food, and Lisa, one of my book club sisters, loaned me a wheelchair! Their texts, calls, and emails are so appreciated. My college roommate, Alda, and another friend, Diane, visited and brought lunch. When one is not able to move around easily, those who reach out in these ways do more than help pass the time, they take some of the pressure off the family. Our oldest granddaughter, Mary Grace, celebrated her 12th birthday and Confirmation this past weekend with a luncheon after church. Our daughter, Tara, and her family live in Georgia. Tara and family prepared most of the food. 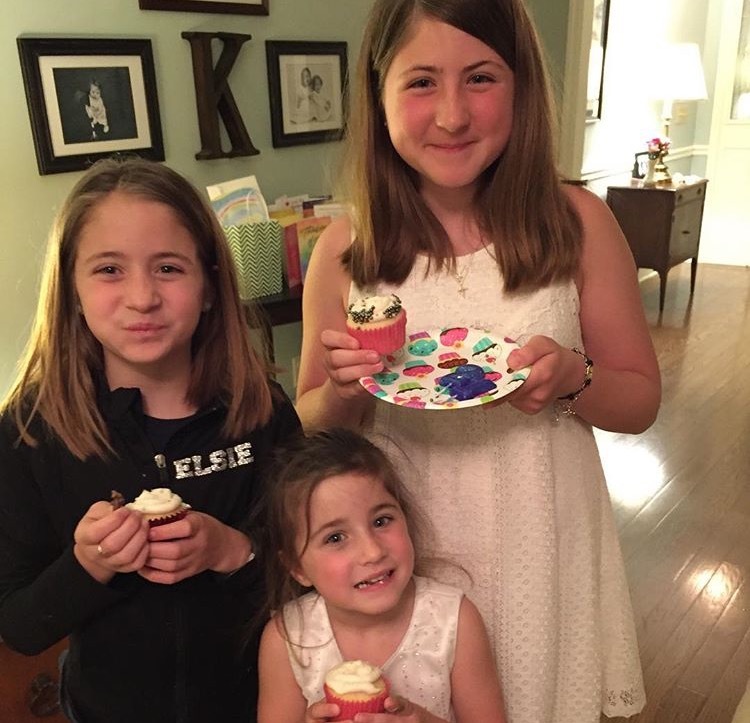 Mary Grace’s younger sister, Elsie, who is 10 years old, made 50 plus beautifully decorated cupcakes for the party. Several of Tara’s friends offered to bring food to the luncheon, to which Tara politely replied that such wasn’t necessary. A couple of friends, Susan and Filiz, would not take “no” for an answer. Susan told Tara, “In the South, we don’t let our friends do these things alone; we bring food!” And bring food they did, lots of it, and it was so welcomed, and delicious. This reminded me of the difference between the “Let me know if you need anything,” or those who offer but when told, “No, nothing is needed,” take that answer as their “pass” to not bring anything to contribute, and those who just reach out and do. Too often I am in the first group. My cousin, Paula, who is more like a daughter, allowed her van to carry us to Georgia for Mary Grace’s celebration, and helped prepare food. She also took me to my hair appointment, which involved spending half of a day caring for me. You know we don’t miss our hair appointments unless we absolutely cannot get there! Now before some reading this feel guilty for what they themselves did not do in these or similar situations, there are a couple of clarifications to be made. Some people are naturally more giving of their time, food, and efforts than others. This difference does not totally excuse our failure to reach out by calling or connecting in some way when our good friends are in need, however some of us give in other ways. You know who you are. Then there are some people who do not give of themselves at all, even when they could and perhaps should. And you also know who you are. I have always written what I need the most, hoping that my insights can also be of value to others. So, this reminder of how to reach out and touch someone is for me more than anyone else. If any of this gives others insight on what they can and will do to show more caring and graciousness, especially to their close friends and family, that will warm my heart. And, those of you who do not need these reminders, please know that you are so appreciated. I know that I have failed to send cards when I should, call when I could, or take food when it was needed. I expect the same is true for some of you. Are we really too busy to do so? Do we not know how and what to do? I doubt that it is that most of us don’t care enough to reach out, or that we don’t know how to, or even that we truly do not have the time to. We just don’t. But those that do can teach us a very valuable lesson, a lesson in graciousness that is remembered long past the specific gift of time, food, and connection. Thank you to all who have reached out to me and my family in our time of need. I will be there for you in yours. You are appreciated more than you can know. This entry was posted in family and tagged family, friendships. Bookmark the permalink. Thoughtfully written, sweet friend. I couldn’t help but think of Mother, she was a servant and never missed opportunities to reach out! Thank you, Pam. Shirshee was indeed a wonderful example of Southern Graciousness, and so many other wonderful qualities. And it came so naturally to her. Gosh did not realize how bad your accident was, hope you are doing better, glad you were able to attend Mary Graces confirmation. Take care of yourself glad you have so many close able to help you out. proudly displayed. Friends are so special; thank you! YOU are a prime example of a Gracious Southern Lady, to the extreme of not sending Dr. Cool to the dog-house! You are too funny, Arturo! Dr, Danks has not one into the doghouse in many years. And I suppose you know Will added a second level to his? !